Before he hired Louis Lower and started the Order of DeMolay, Frank S. Land had tried to copy the “Chicago Big Brother” program in Kansas City, matching young people up with business mentors, but it was not very successful. Either the business leader was too busy or the youth broke an appointment, but it never worked out well. 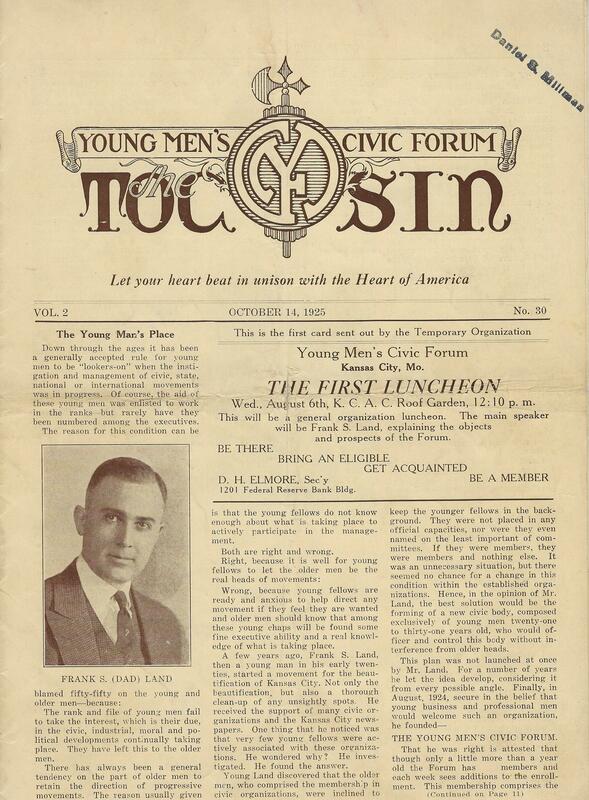 After he founded the Order of DeMolay he was looking for something specifically for fledgling businessmen, and in 1924 he created the Young Men’s Civic Forum for young business leaders aged 21-31. Dad Land was interested in empowering young people in a society that told them to bide their time, wait their turn, be patient. The YMCF was similar, in style, to any other civic club. It attracted some inspirational speakers from industry, the military, utilities, news media, and government. It met at the Kansas City Athletic Club, a private high-class club in the Historic 9th District that catered to society’s elite until 2015. It had great potential for success, and it expanded to a few other cities in Missouri and Kansas. What it didn’t have was Dad Land’s undivided attention and his driving force to keep it going, which he reserved for the Order of DeMolay. And so, while moderately successful in the short term, it didn’t last long, and some of its more faithful members later turned it into The Metro Club, and that finally evolved into the Creek Club, presumably meeting in the Brush Creek area of the city, probably in the Country Club Plaza district of Kansas City. 1.) Do you think there was a need for a club for young men aged 21-31? 2. 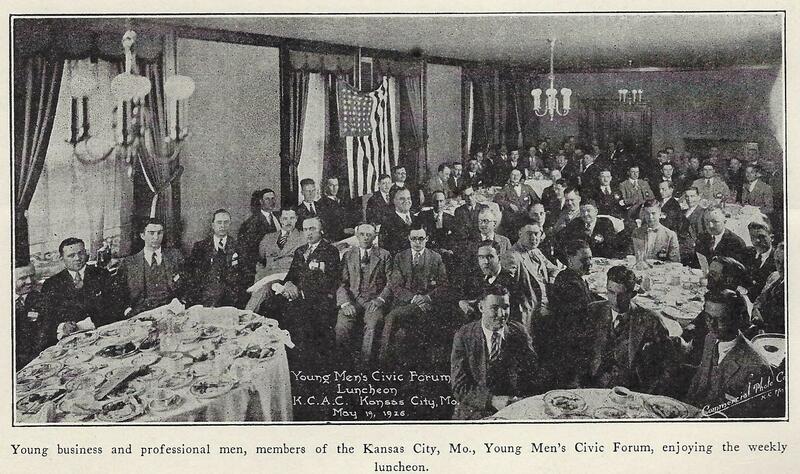 )Why didn’t Dad Land stay involved with the Young Men’s Civic Forum? 3.) Did Dad Land make a mistake by trying to start another program? 4.) Do you know of any clubs or programs that cater to 21-31 year-olds today? 5. )What lessons (we don’t know—just make your best guess) did Dad Land learn from his experience with the Chicago Big Brother program and the Young Men’s Civic Forum? What lessons have YOU learned from it?